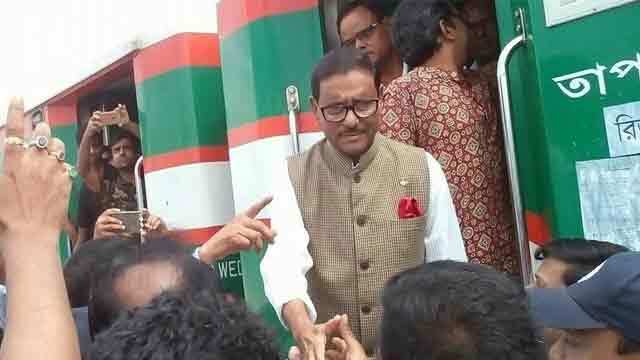 Dhaka, Sep 8 (Just News): Passengers today suffered as the Nilsagar Express was delayed for around 30 minutes at Gharinda Railway Station in Tangail centering the tour of an Awami League delegation led by its General Secretary Obaidul Quader for electioneering in the northern districts. Usually, the Nilsagar Express halts for two minutes at the station but today it left the station around 30 minutes after its scheduled time due to the AL general secretary’s programme there, our local correspondent reports. The normal activities at the railway station were also hampered due to gathering of several hundred local leaders and activists of AL and its other wings at the station, sources said. “Normally the Nilsagar Express enters Gharinda Rail Station at 10:10am and leaves the station at 10:12am,” said Md Jalal Uddin, station master of Gharinda Rail Station. “However, the train entered the station at 10:35am and left the station at 11:05am today,” he said. “The passengers had to wait for the train due to the rally,” the station master added. The Awami League delegation led by Obaidul Quader left Kamalapur Railway Station in Dhaka for Nilphamari by train this morning to carry out electioneering in northern districts. The delegation is scheduled to hold more than 11 rallies at railway stations in Tangail, Pabna, Natore, Bogra, Joypurhat, Dinajpur and Nilphamari districts.